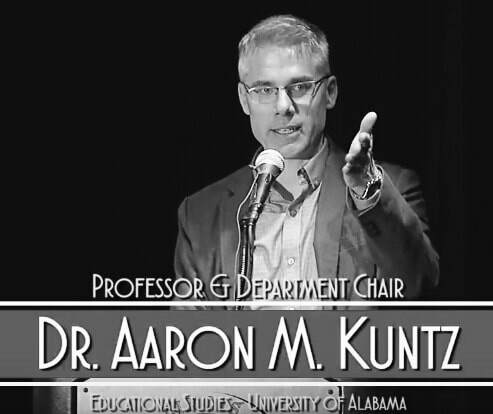 Dr. Aaron M. Kuntz is Professor and Department Head of Educational Studies at the University of Alabama where he teaches graduate courses in qualitative inquiry and foundations of education. Dr. Kuntz’s research focuses on developing “materialist methodologies” – ways of producing knowledge that take seriously the theoretical deliberations of critical theory, relational materialism, and poststructuralism that have emerged in social theory over the past fifty years. He grounds this methodological theorizing in empirical questions about the production of inquiry in the K-16 arena, faculty work and activism in postsecondary institutions, and the impact of the built environment on learning. Dr. Kuntz’s publications appear in such diverse journals as Qualitative Inquiry, Cultural Studies<---->Critical Methodologies, The Journal of Higher Education, The Review of Higher Education, the International Journal of Qualitative Studies in Education, Educational Studies, and others, as well as in numerous book chapters. Alongside colleagues from the Disruptive Dialogue Project, Dr. Kuntz co-authored Qualitative Inquiry for Equity in Higher Education: Methodological Implications, Negotiations, and Responsibilities (Jossey-Bass Publishers). Dr. Kuntz’s co-edited volume Citizenship Education: Global Perspectives, Local Practices (with John Petrovic) was published in 2014 with Routledge Press. In 2015, Dr. Kuntz published his book, The Responsible Methodologist: Inquiry, Truth-Telling, and Social Justice, available via Routledge Press and selected as Honorable Mention for the 2017 AERA Qual SIG book award. Dr. Kuntz’s latest book, Relational Resistances: Qualitative Inquiry, Cartography, & the Promise of Material Change was recently published by Routledge Press. Dr. Kuntz currently serves on the Editorial Boards for Taboo: The Journal of Culture & Education, the Review of Higher Education, Philosophy and Theory in Higher Education, and the Bloomsbury Research Methods for Education book series. He received his doctorate from the University of Massachusetts Amherst. In 2017, Dr. Kuntz was awarded the President's Faculty Research Award for Social & Behavioral Science at the University of Alabama.